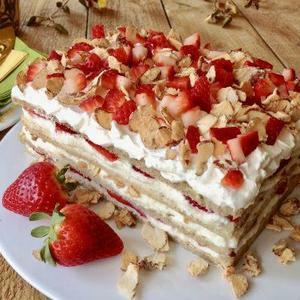 This is a luscious cake that starts with an Almond Jaconde brushed with amaretto syrup, then layered with ricotta cheese, fresh strawberries, and sugared almonds. A beautiful dessert to serve when fresh sweet strawberries are available. Make ahead Tips: Make this dessert over a two-day period. The day before make the Almond Jaconde, wrap well in plastic wrap and refrigerate overnight. To save refrigerator space the cake can also be sliced into the four pieces as described in the assembly instructions, layered with plastic wrap and refrigerated. Also make the sugared almonds and amaretto syrup the day before. The second day make the ricotta filling, whipped cream topping and assemble the cake.